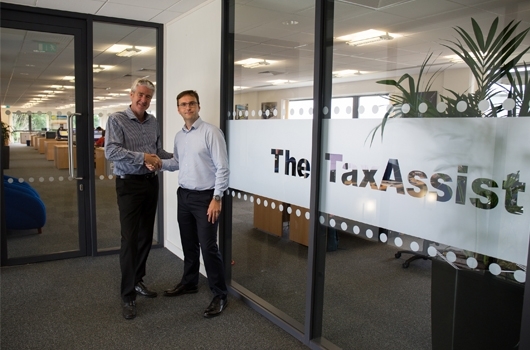 The TaxAssist Group, the award-winning national network of accountants for small businesses, has expanded its Norwich Support Centre, moving into a second suite at Bankside 300 on Broadland Business Park. TaxAssist, which has more than 220 franchised areas in the UK, Republic of Ireland and Australia, and operates from over 300 shops and offices, moved its Support Centre to Broadland Business Park at the end of 2014 when it took a suite of 5,033ft2(468m2). Their new expansion sees them increase by an additional 4,797ft2 (446m2) by taking the neighbouring second floor suite. The photo shows Karl Sandall, TaxAssist Group Chief Executive (left) and Daren Moore, TaxAssist Group Commercial Director.